HomeFashionDay 1 of Delhi Times Fashion Week was all kinds of glamour and fun! 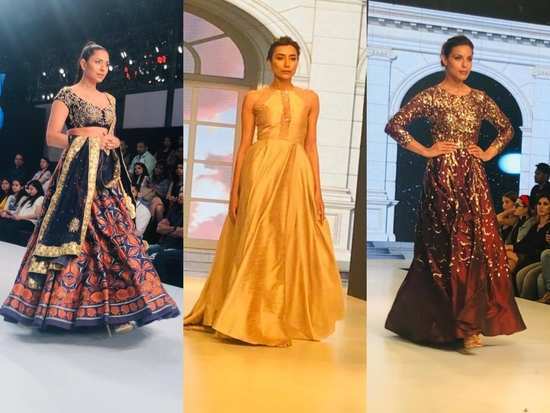 It was just last month when we saw some ravishing designers showing off their mesmerizing collections at the Bombay Times Fashion Week and now is the time for the capital city to do the same. Yes! Delhi Times Fashion Week has begun and with such a bang! The first day was a mixture of grace, elegant and stylish with some fresh colours and exquisite designs by the much talented fashion designers. If you missed out on it, here's a glimpse of everything that went down on the Day 1 of DTFW. Trust us when we say this, you do not want to skip this! JD Institute of Fashion Technology flaunted some superb blend of colours combinations with an all ethnic collection. Needless to say, they started the show all too well. Next up was the flawless collection of Mandira Wirk for which Sophie Choudry turned showstopper. We then moved on to the Indo-western collection by Charu Parashar and Anand Bhushan's resort wear collection. Beautiful and colouful are the two apt words to describe the work put up by both the designers. Ashfaque Ahmed’s collection at DTFW was sophisticated and breathtaking! Last but not the least, the Day 1 of DTFW was closed by the phenomenal collection of Narendra Kumar. Oh, how we love the little grooving on the ramp! Day 1 saw some magical designers on stage with their stupendous collections and we're only looking forward to what Day 2 has in store for us. 1Day 1 of Delhi Times Fashion Week was all kinds of glamour and fun! 3Sonam Kapoor slayed in white, *again*! 4Shilpa Shetty’s latest look is proof that Orange is *definitely* the new black! 5Sonam Kapoor’s opulent white ensemble has a personal detail you may have missed! 7Day 3 of Bombay Times Fashion Week was a glamorous one! 10Bollywood inspired ways to wear white to your Holi party this year!